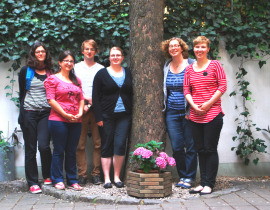 From the 10th – 13th of July 2013 the Executive Committee (ExCo) of the Ecumenical Youth Council in Europe (EYCE) met for their regular meeting in Berlin, Germany. The ExCo also took the opportunity to meet with donor organisations and potential partners located in Berlin, as well as with EYCE’s National Correspondent in Germany and young people that have been involved in EYCE’s work. During their meeting EYCE Executive Committee members reviewed and evaluated the work that has been done since their last meeting in February 2013 in Amsterdam, as well as planned the work of the council for the coming months. Great part of the meeting was dedicated to preparations for the EYCE’s 39th General Meeting, which will take place in Brno, Czech Republic, from 14th – 20th of October 2013. The meeting will be hosted by the Hussite Church in Czech Republic. The agenda of the ExCo meeting included a variety of issues, such as relation to partners and EYCE’s involvement in activities of World Council of Churches (WCC), CALL network and European Youth Forum (YFJ). Special attention was given to reviewing the 14th Assembly of Conference of European Churches (CEC) and the future of EYCE in this context. During their stay in Berlin EYCE ExCo also met with Chairperson and Regional Secretary of the World Student Christian Federation to discuss the collaboration between the organisation and their common response to the challenges of the ecumenical movement. The ExCo also started the initial preparations for the activities in 2014/2015, particularly preparing fundraising plans and scheduling the events, strategically and thematically linking them together. This will provide a substantial support to the work of the new Executive Committee to be elected in October. 26th of January – 2nd of February 2014, “Looking for a brighter future! A training course to foster solidarity in Europe and strengthen the participation of young people”, Spain. April 2014, “Links of Poverty. A training course to challenge the patterns of poverty”, Bulgaria. June 2014, “Say no to Hate! Young people addressing hate speech from an interreligious perspective”, EYCE study session contribution to the No Hate Speech Movement of Council of Europe. November 2014, “Food, Land and Water. A training course to promote the fair distribution of natural resources in the framework of ecological justice”, Russia. Special importance at the meetings was given to the financial situation of EYCE and especially to exploring new funding possibilities and new approaches to fundraising. To seek new partners in fundraising, EYCE’s ExCo visited the new building of the Protestant Agency for Diakonia and Development in Berlin, where they met Mr. Christopher Selbach, the Head of Ecumenical Partnership, Inter-Church Aid and Europe Desk at Bread for the World. The meeting was very fruitful and inspiring, bringing new ideas and developing further EYCE’s upcoming campaign to address poverty. Another successful meeting was during the visit to Berlin Mission, where new possibilities for partnerships and thematic cooperation were discovered. EYCE Chairperson Ms. Catharina Covolo and EYCE Vice-Chairperson Ms. Adriana Florea were warmly greeted to discuss future cooperation. During the meeting the ExCo also took the opportunity to officially welcome the new office volunteer, Ms. Pauline Rosselin from France, who will be working with EYCE’s Campaign to Promote Ecological Justice. We would like to thank EYCE’s member organisation in Germany – Arbeitsgemeinschaft der Evangelischen Jugend – for kind and generous support in organising this meeting!